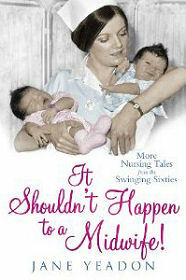 "It Shouldn't Happen to a Midwife!" by Jane Yeadon is a sequel to her "It Won't Hurt a Bit". It picks up the story of her early career as a nurse in the Swinging Sixties at the point where she arrives from Aberdeen for her midwifery training at the Royal Maternity Hospital in Belfast. Actually, it opens as she is dragged back into the crowd by a friend as she, innocently thinking it is some sort of carnival, laughs at the men in bowler hats and eccentric orange costumes marching along Belfast's Falls Road. This is Belfast just before the start of "the troubles" and for Jane, her arrival in Belfast is the beginning of a steep learning curve in more ways than one. Working in a deeply divided community presents challenges she'd never previously imagined, but she soon get to grips with the language and culture sufficiently to begin to make progress on the real reason she is here, learning to become a midwife. Jane Yeadon's style is entertaining and demonstrates a commendable lightness of touch. Belfast in the 1960s emerges through her encounters with its residents, whether it be the curmudgeonly taxi driver who picks her up at the airport or some of the lovely women she helps give birth. And life as a trainee midwife emerges through the trials, tribulations and triumphs of Jane and her small group of new friends: fellow trainees timid Marie, strongminded Margaret, and equally determined English Cynthia. It's difficult not to read of a hospital in the 1960s without thinking back to portrayals in films like "Carry on Matron": especially when real characters like the formidable matron and the professor towing round a gaggle of medical students appear. But this is real life, and here the matron spends her first meeting with the the new students trying to convince them of the merits of buying a book on midwifery which, as once notices, she happened to write herself. Jane Yeadon is a native of Forres and she trained in Aberdeen as a nurse before undertaking further training in Belfast and Edinburgh and becoming a district nurse, which as this book reveals was her ambition all along. Given this background, it seems likely that her readers can look forward to further books recounting later periods in her career: and given her well observed yet gentle style and her quiet humour that is certainly something to look forward to.